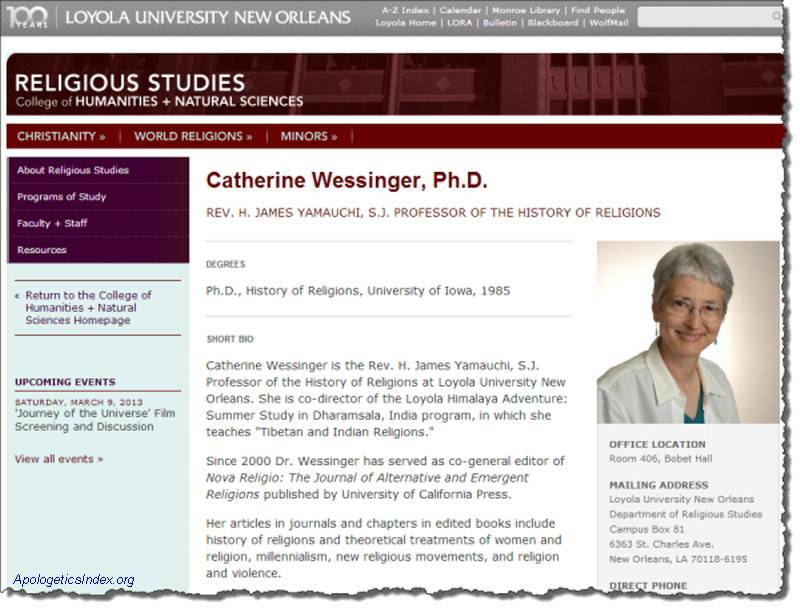 Catherine Wessinger is a professor of religious studies at Loyola University New Orleans. She is also the Co-General Editor of Nova Religio: The Journal of Alternative and Emergent Religions, a peer-reviewed religious studies journal that focuses on New Religious Movements. Considered by many people active in the anti-cult and counter-cult movements to be a cult apologist. On the one hand, she encourages an objective, ethical approach to the study of ‘New Religious Movements’ – rejecting the controversial approaches of some scholars. On the other, her response to the Peoples Temple mass suicide was to blame former members, the media, anticult organizations, and congressman Leo Ryan (who was shot and killed by men under the command of cult leader Jim Jones). In a draft article that was to appear in her book, How the Millennium Comes Violently, she blames the anti-cult movement, Leo Ryan and his staff for the mass murder/suicide Jim Jones led his followers into. See also the Cult Apologist FAQ entry on Wessinger. (Note: that FAQ was last updated in 2002, and many of the links to documentation material have changed. Use the search engine at the Internet Archive to retrieve articles). Collection of articles about Jim Jones and his Peoples Temple on the “Alternative Considerations of Jonestown and Peoples Temple” website, sponsored by the Department of Religious Studies at San Diego State University. The site includes many articles some cult experts consider to be written from a cult apologist point of view.